Size 1MB is MMC5 Limit. PC Fan Ported "Mega Man Ultra 2: TRoX" using Game Maker for PC, released soon. Bug Doropie Sprite in MM's Shot, not fix without invisible. please new utility app project "Rockman 4 Sprite Editor"
Created Doropie Sprite for Mega Man 2 via CSA, don't disable New Tile or Remove Tile. @caesur To be honest, I would like to see three downloadable patches from your hack. I don't think I understand what you're asking for. MM Airslide with Charge Kick and "B" Button, where MM will only airslide if Charge Kick is equipped and has energy, and it can be activated with "B". The actual ASM for that code (in a text file) is in the zip file with the patch. Right now it does what the video shows and I don't know how to make it so he can only airslide once per jump. If I remove the limitations I've set, I can make it so that MM can airslide with "B" forever, while charge kick is equipped. I'd probably be able to set it back to "A+down" and have any weapon capable of airsliding forever, but that's not something I want to do... unless later I want to make a megaman/kirby crossover hack*. 2. Are you talking about the original Airsliding code? Because I want to accomplish that code with "B button" instead of "A+down". 3. Both the original ASM code and my code are in the zip file I linked to. They have comments--formatting got a little weird though. Last view: 74 days @Korxroa That's not what mean. I meant you have to subtract hex 80 which I was meant to say from the current hex and the second byte of the sprite which is the palettes with the flipping. Do the math! Let's say it's hex C0 subtract hex 80 which gives you hex 40 and gets rid of the invisible sprite. I don't think it matters because I suggest that you start over from scratch but keep the current ROM. You can use Doropie for your 2nd rom by inserting your tiles, then open CSA, Clean up data in order to create free space, and start building your sprite. Keep an eye with the RAM addresses in sprite banks. When you add another tile, it should be able generate and it shouldn't corrupt. DO NOT use kill data for Frame and Coordinate data. In Coordinate data, see that red circle Paired with "hex number". That means a single sprite fuses together in 1 go. Sprites in Megaman 4 like the Rush Jet must match with the other and usually causes by changing another ROM OFFSET. It's checked if the 2 sprite coordinates matched together. Left frame should always have a check to verify that the right frame matches the same as the left. Once you're done, copy EVERYTHING from x18010 to x1C00F in your 2nd edited ROM and paste it on your first edited ROM. Somebody actually took infidelity's MM4 hack and remade it in Game Maker? I did some searching via Google and YouTube, and I saw nothing of this. Who is making this project, and is there a link to a site or forum where there are updates of this project? I'm merely curious. I liked MMU2, it had a lot of good stuff in it, and inspired me to work on my own Megaman project. The only thing I didn't like about MMU2 was the difficulty. There were a lot of tough spots in the game that really needed to be touched up, but other than that the content was good. Last view: 74 days @Korxroa Once again, your sprites are not paired in all points of your video related to your question. If your left sprite didn't match the right during the process of the CSA editor, then it isn't paired together. It took me a while to figure it out for me I got the hang of it. Even I got help from Matrixz back then. The easiest way for me is to relocate the Sprite Coordinates ROM Offset into an unused space and create a pair for both left and right sprites. Sprite Bank ID for Mega Man 2? 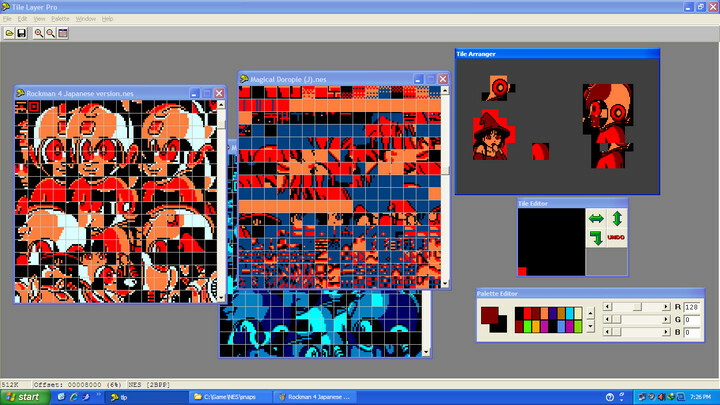 If you can't create new tiles for Mega Man 2, you can add more tiles manually from 9 to B. Try to create new sprites manually in a hard-wired unused space. I don't know much about Mega Man 2 hacking and I don't often hack the game. There should be a lot of unused space in hard wired banks. Custom Doropie Sprite (Roll Style with Tiles 9) in MM2 via CSA, Screenshot soon. yea most of it is just before every level's level data. like level data is A10-200F for about 20 something levels right ?? well the rest of the A00 bytes before that contain misc stuff like mid bosses and boss fight AI, but not all of it used used, just filled with tons of random numbers. NOT code...not data... just random garbage that can be used for whatever you want to do. 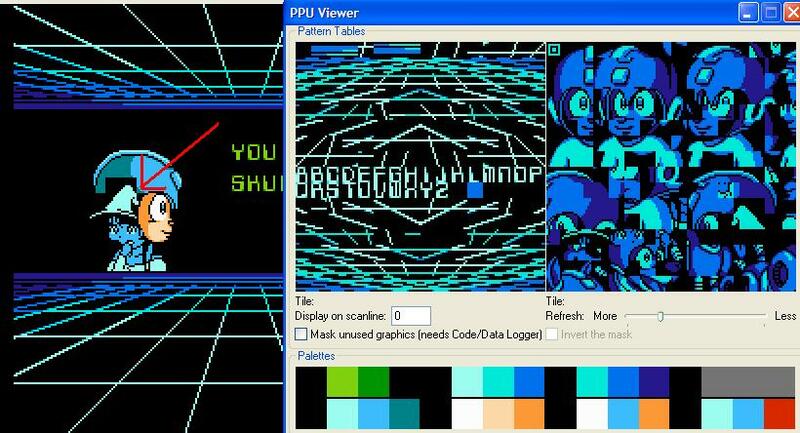 There's an old disassembly for Megaman 3 made by a person associated with Color Dreams. I also have a question. I've examined the RAM during gameplay, and $07E0-$07FF seem to be completely unused, is that right? It would be really handy for custom code later on! Last view: 74 days Roll Chan's 2nd set of tiles inserted to Rockman 4. The last phase may be easier if I had figured out. I'll take Rockman 5/Mega Man V for example. Change ROM Offset at x3624E to Hex 01 will allow Rockman to do a standing jump which means the Sprite CHR banks won't change. That would be an example of how to put up CHR animations to Rockman 4. My CHR set in Rockman 4 goes like this for Roll Chan mobile. Yes, there is a bit of unused CHR space which I did create room for it without ROM expansion. Last view: 1679 days I need some help with the FCEUX debugger. is getting the #$01 from. I've tried Step Into with the "shoot the arrow" part of Super Arrow's energy deduction but it didn't take me to the hex value listed in the post. I'm sorry if I'm sounding like an idiot, but what am I doing wrong? I need some help with the FCEUX debugger. I'm new with the debugger myself, but I think you can set the Step Into when that address' value changes. The newest FCEUX debugger should tell you the address, where the current instruction is found at in the ROM, at the bottom of its screen. Alright, I was able to find the correct address. Thanks! On another note, is it possible to make it so you start with Super Arrow, and if you can't, is it possible to switch Rush Coil and Super Arrow? Wrong Tile Doropie Sprite in MM's Animation with Get Weapon Screen?? Before you add new tiles, you should first use blank tiles available on a given scene. The Get Weapon scene has a few usable blank tiles. Do not use or overwrite existing game tiles so you will not get that garbled pic. If you are planning to replace Mega Man with Doropie on the Get Weapon scene, I suggest you shrink Doropie down so that she would fit. (She has a big witch hat which is troublesome). 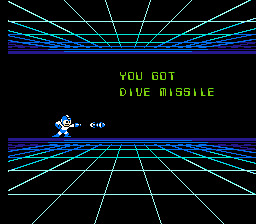 The part where Mega Man spins 180 degrees, if you do not like to edit the whole spin, try getting to use only the facing-front pic; it will save you tons of tiles to use. You can to that with Matrixz's CSA. I'd say it would be a good idea to replace the spin animation with something new. You could do a full side Doropie doing some sort of victory pose or something. Pretty much anything that can take up 4 looping frames of animation will work nicely. 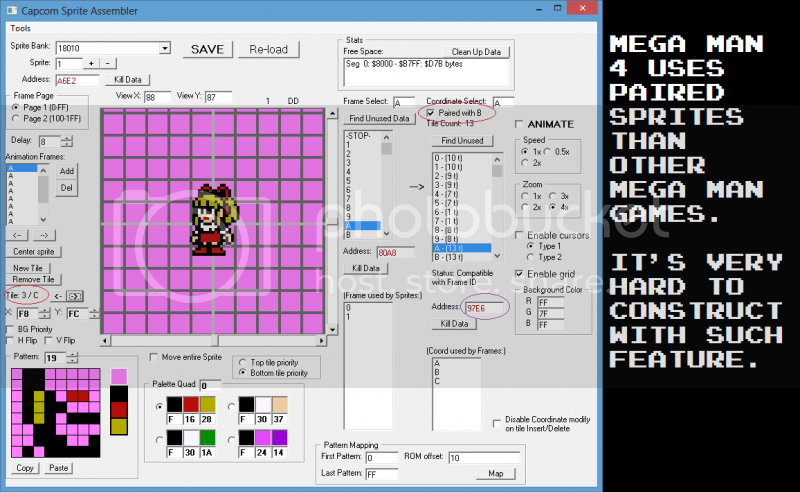 Mockup Weapon Preview, Similar to Matrixz's MM4 Hack called "Mega Man Forever"
Screenshot Roll Chan 4 or Roll Chan 4 Mobile Edition in Get Weapon Screen? Do you have any replacement for Doropie's "Rush"? MySQL - queries: 131, rows: 172/0, time: 0.168 seconds.